Did you see the news about Gourmet? I am sad. I need something to make me smile. Something like pudding. Maybe coffee pudding. Some chocolate would be good, too. Oh, ya know– I have just the thing in the fridge right now, since Garrett of Flavor of Vanilla picked Split Level Pudding for TWD this week. Pudding on top, bittersweet ganache on the bottom. This is just the thing to make me feel a little better. Excuse this short post, but now I’m off to make you something from the pages of Gourmet. For the recipe, see Baking: From My Home to Yours by Dorie Greenspan. Don’t forget to check out the TWD Blogroll! 2 flavors of deliciousness, it does not get any better than this!!!Mmmmm! Holy Moley – those are perfect curls… that looks 4-Star-worthy! Right out of Gourmet… 😦 Love this combination – the coloring and, I’m sure, the flavors together are fantastic. Beautiful! I had not heard about Gourmet, I’m so sad I love that magazine. Your pudding looks delish and your picture as always looks great. I just love your pictures. The way you turned the spoon over is so simple but just perfect. Did you love the coffee flavor? This pudding is just the thing to cheer anyone up! Looks great. Gourmet is shutting down? Wow. 70 years. I am so sad about Gourmet too!! It’s terrible!! But your pudding does look fantastic!! Love those chocolate shavings!! I was stunned to read that Gourmet is folding after all this time. Such a shame. Frankly, I’m also stunned by the beauty of your pudding. Absolutely gorgeous. The coffee and chocolate must have been a tasty combination Great job! Times are proving to be quite difficult when wonderful magazines like Gourmet begin to disappear. Sad about Gourmet but glad the pudding could cheer you up! I couldn’t believe the news about Gourmet! So sad to here. I still can’t believe Gourmet is closing down. I was really looking forward to their holiday issues because those are the best. Well, pudding does make things better, right? Ah! A coffee fan like me… anything coffee I like! I too thought of coffee for this one, and although my association sounds a bit strange, I discovered it last winter in a fine chocolate… you must try enventually, it is heaven! Very, very pretty too, Steph! I am heartbroken about Gourmet. It was my new love, and now it has been unceremoniously taken away (Gourmet’s closing is really bringing out my inner drama queen). I was thinking about taking the month of November and blogging everyday with a recipe from the final issue. Enough about me, that pudding looks fantastic. I love the combination of coffee and the bittersweet chocolate. Your pudding looks heavenly. And yes – very sad news about Gourmet. Looks wonderful. Coffee pudding would be a hit with the husband. Your pudding looks fantastic! What a perfect comfort food to have on hand as we mourn the loss of Gourmet. Wow. Your pudding looks so delicious! Gorgeous pic Steph, and great ratio of pudding to ganache! 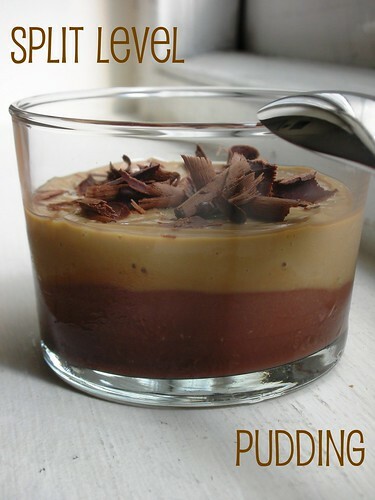 You and I think alike as I planned on doing chocolate with coffee pudding. Only problem is my pudding never became pudding. Instead we had slushies! Still yummy. It is gorgeous and I love the coffee flavors! Beautiful pudding. Love the curls on top. I’m sad about Gourmet as well. A big loss in the culinary world. Good looking and comforting coffee and chocolate pudding! Yours pudding “pick me up” is beautiful! I love that there is such a nice healthy layer of ganache with your coffee, oh I mean coffee pudding. It looks perfecto! I could not believe the news about Gourmet. Pudding makes lots of things better. Your pudding looks great! ohhh this looks sooo good!